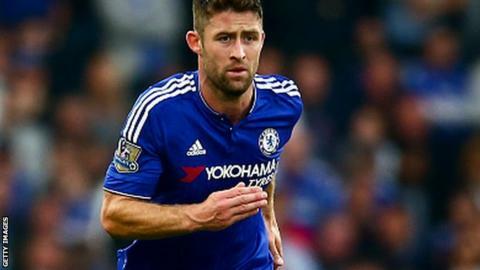 Chelsea defender Gary Cahill says he has held "positive" talks with interim manager Guus Hiddink and wants to remain at Stamford Bridge. The 30-year-old England international joined Chelsea from Bolton in January 2012 and signed a new four-year contract last December. He has not started in the Premier League since 26 December, though. Asked about his meeting with Hiddink, Cahill said: "He was very approachable and it was beneficial, very positive." Kurt Zouma and John Terry have become preferred starters in central defence as Chelsea have gone nine matches without defeat under Hiddink. There were suggestions that Cahill had become concerned about his future, as he attempts to secure a place in England's Euro 2016 squad. "Obviously, I want to be at the club," he told Chelsea's website. "I signed a contract a couple of months ago so that shows I want to be here. "But ultimately, I feel like I need to play football matches. I've always been that way; it's always been in my make-up to play a high percentage of games. "I realise sometimes things go well, sometimes they don't, but it's very important for me to play football matches."